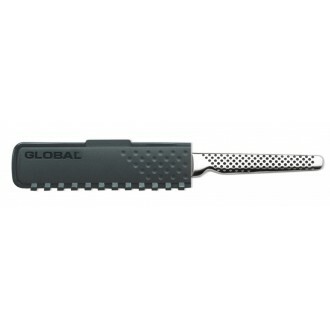 These Global magnetic knife sheaths provide a cost effective and clever solution to storing your precious knives safely. The magnetic closure ensures that the sheath is securely attached to the knife blade and will not slide off. If you don't have the space for a knife storage block or a magnetic rack these sheaths allow you to store your knives safely in a drawer without the worry of damaging the egdes or your fingers!